Personnel – Peyton Pleninger: tenor saxophone; Edward Gavitt: guitar; Nick Dunston: electric bass; Colin Hinton: drums. The blazing chops of Texas-born, Brooklyn-based drummer Colin Hinton are marked by raw intensity and spot-on fidelity. 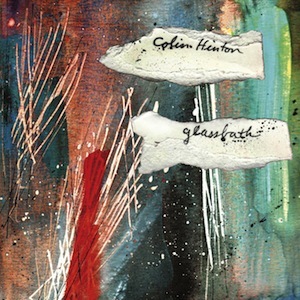 For his debut album, Glassbath, and despite the proficiency in a wide range of styles, his energy was canalized into a particular stratum where the avant-jazz cohabits with a panoply of alternative rock subgenres. The tunes were written under two weeks for quartet and the album recorded in a one-day studio session. The inaugural track, “Welcome” drives us to a realm of tautness populated by saxophone grunts and interjections, noise guitar, unruly bass roams, and rambunctious drumming. The versatility of the quartet is on full display throughout the recording and the differences are noticeable when one compares the experimentalism of the opening tune to the restrained variation of the same song, entitled “Goodbye (Welcome Reprise)”, that closes the album. Just focus on the bandleader and you will find him concentrated on flavorful brushwork and spicy tom-tom inflections on the latter piece. The sluggish rhythm of “Rontgen Smile”, exposing accents on the second and fourth beats, is reinforced by sparse bass tonics and fingerpicked guitar. The melody factor is upgraded, but the pacification ceases when the band flips out into a cacophonous turmoil that primarily passes by a forceful ska before reaching a freakish indie rock style whose sonorities resemble bands like Pavement and Half Japanese. Taking into account the refreshingly unpredictable transitions, Hinton’s fractured songwriting largely benefits his hyperactive routines. And yet, after the storm, everything returns to the initial rock-based melancholy. Interspersed with the longer tunes, we have shorter interlude-like pieces penned by the band, such as “Wasteland”, an atmospheric toned-down orchestration with multiple gongs, chimes and metal clangs, “Cobalt-60”, a gloomier version of the previous, and the cathartic “We Are Already Dead”, where the guitarist, Edward Gavitt, stays plugged in and cranking up. You can dance to the sound of “Felines”, assembled with prickly guitar riffs and chords burning in distortion, plus a melodic, often-groovy improvisation by Peyton Pleninger on tenor. It’s like if electrifying groups such as Sonic Youth and Wire were having a conversation with jazz explorers like David Murray and Fred Anderson. The same idea is transported to “Last Refuge”, a song with a vigorous rock pulse, while “The Great Heathen Army”, half-dark, half-heroic, presents refractory rhythms and guitar-sax interactions turned into unisons in its final section. Oscillating between an undemanding pop ballad and a post-rock adventure, both “Partial Eclipse” and the closing tune, “Redemption Through Recovery”, show an unflappable energy, even staying among the record’s slower tunes.
. As of now, the bar is raised high for the work that will follow, which is, naturally, a very good sign.